Are you squemish about blood? You are? Ok...I'll save that story for next time. I have to say that I'm the type of guy that will let my car run on fumes before I go to the gas station. The gas station is just a waste of my time and so the fewer times I have to go there; the better. Oh, and I have one of those cars that when the dummy light goes off that means: "Do not pass Go, go directly to a gas station!" I'm also fortunate to be in one of the only two states in the nation that don't allow you to pump your own gas. I like that. Some people get all incensed like their freedom is being yanked from them. Get a grip and move to Montana! Sheesh. They obviously don't live in Portland where it rains 2000 days a year. So while the idiots in Washington just north of us have to get out in the cold and rain and figure out how to operate the damn pump, I'm snuggly in my car letting some halfway-house employee do the job for me. I mean really, look at the idiots that have pressed the stickers instead of the actual buttons on this photo of a gas pump with instructions! I'll admit, on occasion I've been forced to pump my own gas because I would have had to push the car over the border back to Oregon to avoid it; and there have been times when that was just as tempting. So go out there in your dress ups and shower your hand with gasoline as you go to your big night out. I'll be listening to tunes and letting somebody else bath in fuel instead. Man. I pump my gas all the time, and it really is pretty easy and not a big deal at all, ya pansy! But there are also places you can go where they pump it for you- I go there when it's pouring or freezing or I'm just feeling particularly lazy. We have to pump our own gas in Michigan. Years ago there were a few places that had "special days" where an employee would come out and do it for you, but I haven't seen any of those in a long time. Usually it's not that much of a hassle, I guess. Except for the wintry/snowy/icy/rainy/miserable/summery/hot/humid days, which is most of the time here. Plus no sales tax! Why doesn't everyone live in Oregon? Oh yeah...that rain thing. Yeck. Of course, in places that have self-serve, the gas is cheaper if you pump it yourself. Saving money is a big incentive to do a little work. Gas? I can't afford that stuff but after a night's work selling myself, I'm finally able to pay for a tank. Then I have to master swiping my credit card. Yes, I know there is a photo/image telling me how to do it but that would imply getting out my readers. Rain? What is this stuff you call rain? Send it to us, please! There is one station here that allows you to pump your own gas for the bargain basement price of five or ten cents less per gallon than full service price. 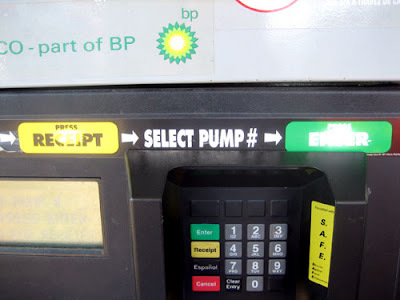 Big fecking deal because the pump itself is like the Rubik's cube of gas pumps. Otherwise, it's always full serve and by "full service", you might be lucky to have someone clean the windshield. I don't mind pumping gas and I've ever gotten it on me. But since I get 50 miles a gallon, I don't have to fill up all that often. When I first started driving, we were not allowed to pump our own gas. It was against the law. We would hop out of our car and convince the guys to let us pump the gas. We really thought we were being women libbers who could show the men that we could do something they felt we were too stupid or incapable of doing. Then came the first middle east embargo and gas shortage, next thing we knew they were telling us we had to pump our own gas or pay someone a lot more to do it for us. I have never minded pumping my own gas and with our mostly great weather, it is not a big deal. I guess it is just a matter of perspective and having the freedom to now make a choice. But thirty days of rain might change how one looks at pumping gas. i thought jersey was the only place that didn't let you pump your own gas! it was rough when i went down to MD for college. i couldn't figure out how to pump my own... happy to be back where the attendants have to brave the rain and cold in order to fill me up. That reminds me: A friend of mine works at a truck rental depot that also sells diesel. Unfortunately he has to carry a persuader so the drivers don't take it upon themselves to fill up ( which they will if no-one's payin' attention ), then drive off w/o payin'...( which can and has happened ). His persuader is a snub-nosed .38...! Mrsupole – It’s still against the law in our state…always has been. The problem I have with the freedom of choice is that there isn’t one once they move to self serve. 90% of the stations make you pump it. Where’s the choice in that? Lime – Ah, it’s NJ that is the other state. Yes, we see the same thing here. You can get over to Washington in about 10 minutes where they have self service and it doesn’t change the price.